Red Tide, or Karenia Brevis, has spread around the state on all coasts, while it has died down in Charlotte County. Scientists test samples along the Gulf and the Atlantic every day, posting the updated accumulated data once a week on the website for Florida Fish and Wildlife Commission. Charlotte County has kept its state of emergency going while Sarasota County has ended its emergency for the time being. 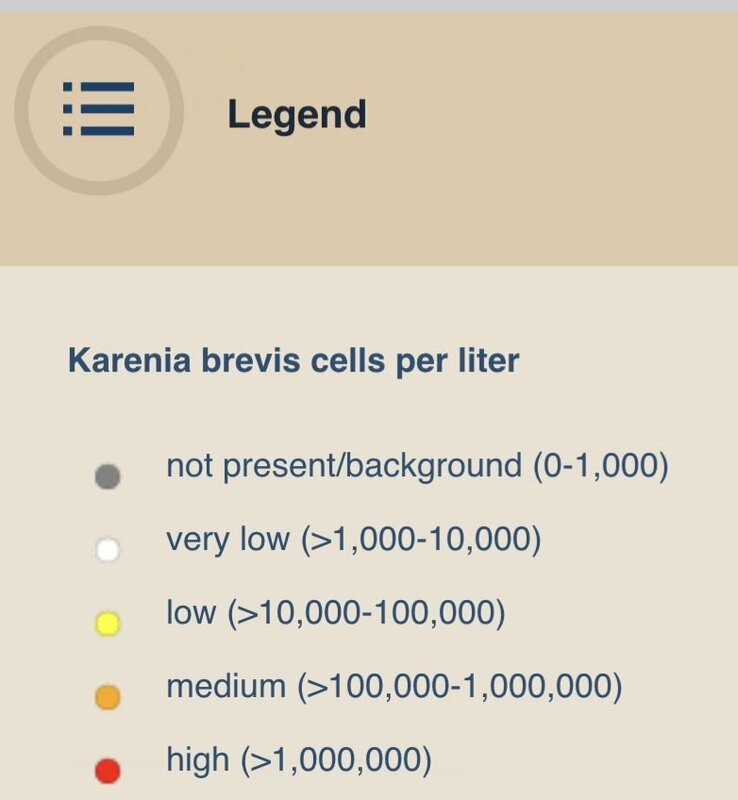 These are the indicators that the state uses to show how much red tide, or Karenia brevis, is found in each sample water. The state counts the number of algae cells per liter of salt water. Red tide algae readings dropped to minimal, but then edged back up to medium this past week along Charlotte County’s Gulf coast. Low readings of the algae Karenia brevis prompted Sarasota County to drop its emergency status earlier this month, but not Charlotte County. “We have seen improved conditions on our beaches since the week of Oct. 9, though we did have some minor fish kill today on Siesta, Turtle and Lido beaches,” said Sarasota County spokesperson Drew Winchester Friday. In Charlotte County, commissioners have been re-voting the emergency status without discussion at their bi-weekly meetings. The first declaration was on Aug. 14, the day after the state issued its declaration. “It’s offshore and it could come back,” Commissioner Stephen R. Deutsch told the Sun when asked why the board has continued the state of emergency. Commissioner Joe Tiseo said the board has continued the state of emergency on the advice of the county’s legal department. Charlotte County spokesperson Brian Gleason said the county is keeping its emergency status going as a precaution and to enable grant applications. “Charlotte County is maintaining the local state of emergency for red tide because algal readings are unpredictable and we want to err on the side of caution before lifting the declaration,” he said. Interim Director of the Florida Department of Health in Charlotte County Joe Pepe noted that emergency status allows the county to act more quickly in contracting for services related to the emergency. Extremely high levels of red tide have plagued Southwest Florida since last fall. More recently, it has moved to the state’s Panhandle, and for the first time in decades, to the east coast. The red tide toxin causes respiratory distress in humans. It kills fish as well as marine mammals.